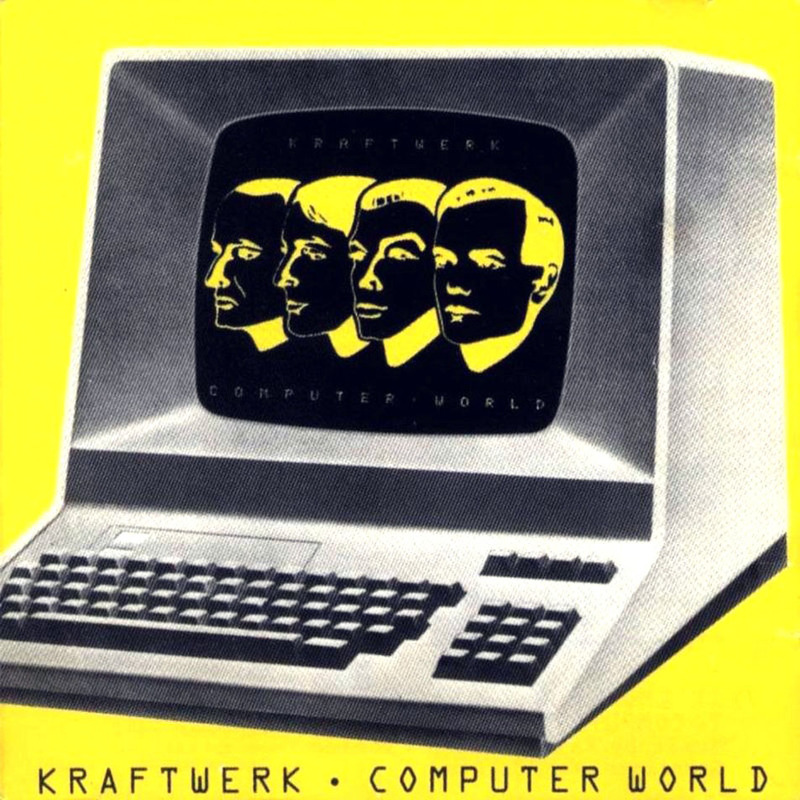 In honor of Kraftwerk’s snubbing by those Rock and Roll Hall of Lamers, I thought I’d say a few words about my favorite album by some of my favorite Krautrockers, Computer World. I love it. It’s great. Okay, I’ll say a few more words. The first record I ever bought of Kraftwerk’s was Trans Europe Express. It was really weird to me at the time. Some of it I liked, but the singing bits were just a little too out there for me. “The Hall of Mirrors” was just kind of bizarre, and my kids would just laugh whenever I’d play it in the house so I’d just skip over to the more instrumental bits. Still, I loved the music. This was back in 2007. Before that, my experience with Kraftwerk was more from a distance. I remember seeing them when I was a little kid and just thinking they were completely strange. I preferred Max Headroom to these mannequin-esque looking Germans. Two years ago I was in Fort Wayne browsing the vinyl at Neat Neat Neat Records and happened across a great copy of Autobahn. I snagged it and proceeded to play it continuously for the remainder of the summer. It was lighter than Trans Europe Express; the band still had long hair and look relatively hippie-ish. But opening track “Autobahn” was 22 minutes of Krautrock bliss. The whole album was and is damn great. Computer World came out in 1981, and it’s an album of its time. By then Kraftwerk had transformed from German hippies playing with synths to plastic-looking humanoid androids in suits, standing behind IBM computers on stage. The music was cold, chromed-out, and emotionless. Man-Machine had come out three years prior and sounded as if they’d began streamlining their sound. You knew what to expect. With Computer World Kraftwerk finally honed in on those great things they’d been doing for years and melded them perfectly with “the times”, as it were. “Computer Love” is about as pop as pop music got back in 1981. Hell it’s still a great pop song. Those Coldplay pretty boys even sampled the song on their 2005 album X&Y. The track “Talk” benefits greatly from Kraftwerk’s melody. But besides the great pop tendencies on this album, Computer World feels like a cohesive story from start to finish. It feels like one long song with each track as a section of that song. From the opening of “Computer World” to the final track “It’s More Fun To Compute”, you get this feeling of constant motion. “Pocket Calculator” is more fun; it’s lighter fare compared to the more darkly lit “Home Computer”. This is like a concept record they wrote after seeing into the future. They saw where we were going with technology and put it to their quirky, electronic melodies. If you don’t believe me about this great album, read this. This guy knows his stuff. It is such a wonderful album (and cover). Guess they invented retro-futurism too. Glad I don’t have to pick a favourite Kraftwerk album! You are right! They did invent retro-futurism as well. Just one more reason why they should have been inducted in Cleveland. Computer World always ends up being the album I go back to most of theirs, even though I love many of their albums. Thank you, although I do insist I know very little about vast amounts of things. This is probably the ‘Werk LP I come back to most often. It’s a very textured LP i think and hey mama, there’s a whole lotta bleepin’ going on! The bleep will get you every time. Bleepin’ bleeps. I think ‘constant motion’ is a great way of describing it.